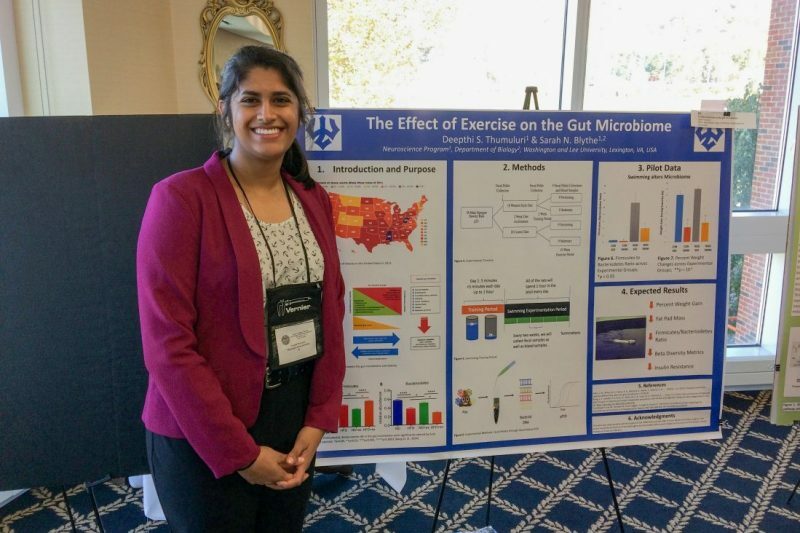 ‘Entranced by Science’ Deepthi Thumuluri '20 won a Virginia Academy of Sciences grant to continue her research into the relationship between diet-induced obesity, exercise and the gut microbiome. I was really lucky to grow up in a family that really valued science and believed in how important it was that we are always learning more about the world around us. Some of my earliest memories of science are my dad sitting next to me on planes and explaining how a metal box was able to fly in the air. Seven-year-old Deepthi didn’t understand Bernoulli’s principle in the slightest, but he ensured that I would always be entranced by the science of the natural world. The older I got, the more I began to question why humans are the way we are and how we got to be this way. This is why I then transitioned into exploring more about biology and the history of humanity. How did you end up at W&L? Full disclosure: I applied to W&L after I saw the Admissions brochure that came to my house in the mail. Something about that flier stuck out to me, and I decided to apply totally on a whim. I then came to visit after I was accepted, and that was when I decided that I wanted to be at W&L. I loved that the student body was so welcoming and friendly, and I loved that the faculty were super involved with every student that they interacted with. Fun fact: I actually met Professor Sarah Blythe when I first came to W&L. When I had to fill out my preferences for an advisor, I asked for her and I’ve stayed with her ever since. 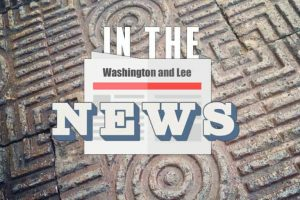 What projects at W&L have you worked on? I started working for Professor Gregg Whitworth as an HHMI fellow during my freshman year. At that point, his lab was working on studying a species of bacteria that seemed to play a really important role in understanding how the gut microbiomes of animals change in response to diet and estrogen. I learned all about how difficult it is to grow cells and how much of it is sheer luck. More importantly, I learned to get really comfortable with failure and accepting that a huge part of science is being dynamic and constantly willing to learn. I also learned how our lab uses molecular biology to better understand the physiology that other labs explore. This was a summer of learning how to be in a lab and understanding more about what exactly I wanted to study. I spent my second summer also doing molecular biology, but focusing more on how different diets effected the gut microbiomes of both male and female rats. By working over 50 hours a week for the entirety of the summer, I was able to get a lot of data about the diversity of the gut microbiome. Professor Blythe helped me tie this molecular biology to the physiology and neuroscience. She and I also collaborated on designing my current project which will focus on how the gut microbiome changes in response to a restriction on diet and exercise. Tell us about the research grant you just won. In November, I participated in the Virginia Academy of Sciences Undergraduate Research meeting and submitted a grant proposal, which I won. My $750 grant will go toward further research on the relationship between diet-induced obesity, exercise and the gut microbiome in order to expand treatment options in the face of a nationwide obesity epidemic. The beneficial effects of exercise, specifically long-distance running, are well documented in scientific literature but are also well known to the general public. Emerging evidence has shown that there are also effects of diet-induced obesity on the diversity and health of the gut microbiome. However, little is known about the impact of swimming as an exercise regimen on gut diversity in obese animals. Swimming is a unique exercise because it is low impact, and therefore can be utilized by those who are unable to run. This study will also allow us to compare the impacts of a Western-style Diet (WSD) and a control diet on the gut microbiome via a well-established marker of gut health, the Firmicutes to Bacteriodetes ratio, and overall phyla level analysis. This study will add to the existing literature, as swimming and WSD are novel approaches to altering the gut microbiome. As part of my professional career, I would like to work in a lab which deals with diseases that are very much current problems in society. I also would love to continue to work in a lab that bridges the space between physiology, molecular biology and computational biology. Being able to work in the same lab for two years has taught me a great deal about all of those fields and how closely they all interact. Additionally, this lab experience has taught me how to take ownership of my work and demonstrate diligence and determination to reach an end goal. I chose my major because I have always been really captivated by the brain and how it controls everything that we do in such a seemingly effortless way. Also, I think it’s so fascinating that we learn to do so many different things so well that they become almost second nature. I am so inspired by all of the professors in the Biology Department and Neuroscience Program for being passionate educators, as well as being incredible scientists. W&L students are so fortunate to have professors who are genuinely invested in the well-being of their students and in furthering the body of knowledge in their field. I truly believe that this perspective on academia allows all of us to cultivate our own passions. Those who matter don’t care, and those who care don’t matter. Working out or quality time with my loved ones. A Ph.D.? I’m not entirely sure in what, but I’d love to teach at some point.